Miracle of miracles, I finished Ginny’s dress before Vincennes last weekend. When I say “before,” what I really mean is, “on the way to…” I was definitely pleating the sleeves near the elbows in the car as we drove to the event site. And even then, there’s some overstitching I didn’t get to on the skirt. I stupidly washed the dress after the event, so now there’s a decent amount of fraying I’ve got to contend with. But I’m not worried. As long as I get to it before the next event, I’ll be okay. All the pleating worked out well, though the dress is still a bit big on Ginny, as you can see in the photo above (thank you Allison, for helping me get her at least a little still for this picture). If we were reenacting in the near future, I’d put another pleat in the skirt and figure out a better way to tighten the waist. As it was, tying a length of bias tape around her worked okay, but since babies/toddlers don’t typically have much in the way of a waist, it didn’t really stay put the way I would have liked. 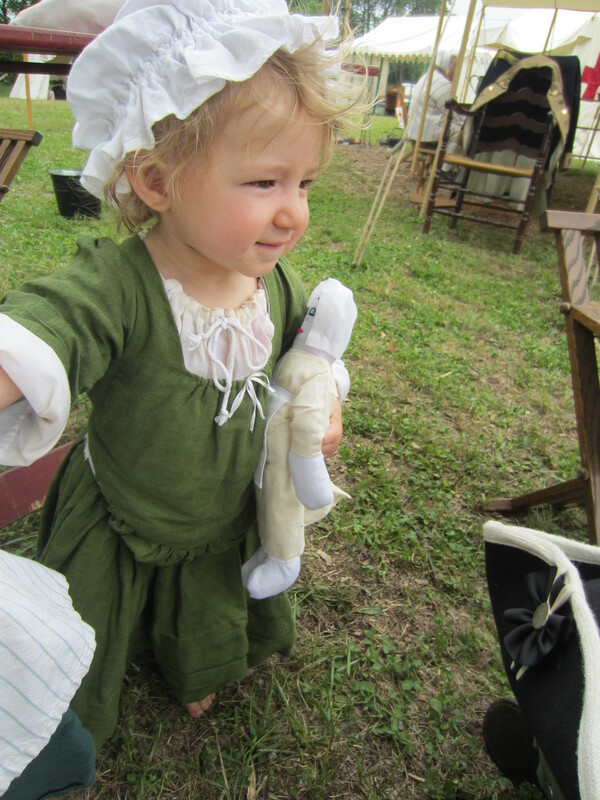 If you’d like to know where I got the pattern for this toddler dress, I used Beth Gilgun’s pattern from her book, Tidings from the Eighteenth Century . Then I hand sewed it, which I’m very proud of. But I won’t lie…it was very time consuming. From what I understand, this gown is very authentic, but I don’t have any formal documentation for it. I intend to look into that for the future…probably a good thing to have and file away. I did make it through Vincennes okay, considering we were out there for four days with our 1½-year-old, and I was 34 weeks along. I am a little worried about reenacting with a young toddler and a newborn later in the season though. But then, I’m a little worried about having both a young toddler and a newborn in general. Yikes! 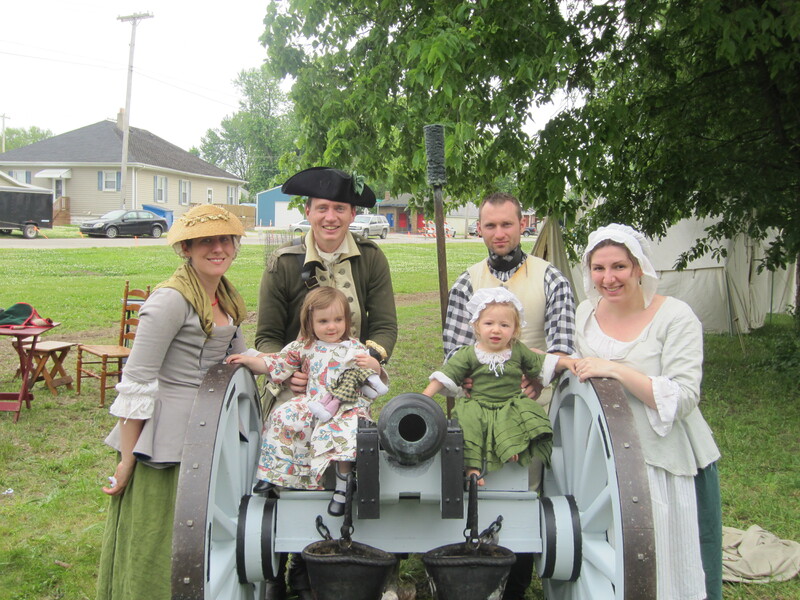 There is another reenactment this weekend: Klash on the Kankakee, June 7 & 8, 2014. I really wish we could get out there and reenact, but being eight months pregnant, we’ve decided to cut ourselves some slack. Vincennes was pretty difficult, and that was with great weather. Also, I’m at the point where a couple more weeks of being pregnant does make a huge difference. If I didn’t have Ginny, I’d probably tough it out. However, I can’t just skip it. “Klash,” as we call the event, is where I met my husband six years ago. This event is near and dear to my heart. It’s a little smaller than some of the other events in the midwest, but to be honest, that’s one of the things I love about it. I find smaller events to be a little more up-close-and-personal with the public. At least, that’s been my experience. So we’re going to stop by as spectators and watch a battle from the other side of the rope line. That’s such a weird prospect. But seriously, I can’t just miss this. Kankakee is an hour and a half south of the western Chicago suburbs, if it’s even that far. So it’s close, and a good number of our friends and family will be there. Like I said…I can’t just skip it because I’m really gigantically pregnant. If anyone is interested in coming out to the Klash, it’s at Governor Len Small Memorial Park. The address is 801 S. Eighth Ave, Kankakee, IL. And if you’re interested in learning more about reenacting and how you can get involved, please, please, please feel free to comment below or email me at kathleen@sweetpeasandsoybeans.com. Sure, we’re getting pretty good at growing our recruits (there’s a surprising amount of babies out there right now, and more on the way), but that’s more of a long term plan. We’d love to get more immediate recruits as well. Nice post about Ginny & yourself. She is such a cutie! Wishing you the best in the next few weeks. You are a tough gal and you will make it with flying colors! So sad we were not at Vincennes and will not be at the Klash. So probably will not see you until Highland, new baby and all!!! Hi to Thomas and give Ginny a big hug and kiss! Thanks Barb– I’ll definitely give them a big hug and kiss for you. 🙂 Do the same for Denny, will you? We missed you at Vincennes, especially since we basically combined Hamiltons’ and the Marines’ camp, even more so this year than in the past. I didn’t know Ginny is going to have a sibling. I’m always the last to know!! Congratulations!! I hope the event will go very well with a minimum of discomfort. been sent out yet, but reserve that date, O,K,? Love to you, Ginny and Thomas. Ginny is so adorable in her dress!! Thank you for sharing!! I had a great time playing peekaboo and then reading stories. I’ll be sure to bring more board books the next time we’re at a reenactment together! Previous Previous post: Why Eat Across the Rainbow?